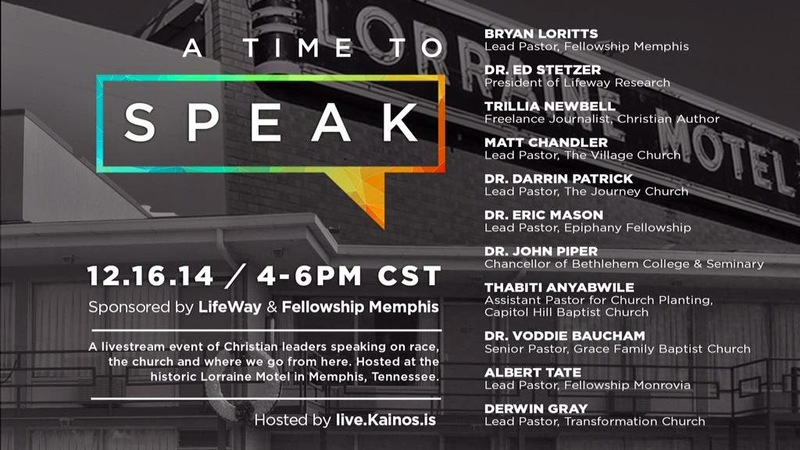 "A Time To Speak": Where Do We Go From Here? I joined with a diverse group of over 30 leaders from Cru at our Orlando headquarters to watch the two-hour livestream together and to participate in a 90 minute discussion afterward. I won't attempt to comment on all that happened during the event (a couple of worthwhile summaries can be found at Reformed African American Network (RAAN) here and here) but, overall, I was pleased that this type of discussion was taking place. I would have preferred more woman on the panel and greater diversity in the ethnic and theological backgrounds of the panelists but those that participated did an admirable job. In a country that has been historically divided along racial & ethnic lines, many of our churches have often trailed behind the broader culture in responding to racial injustice and actively moving towards unity across ethnic lines. I appreciated the emphasis that was placed on the importance of individual action and friendships in order for us to see healing in the Church. Although most panelists acknowledged the existence of systemic injustices, there was agreement that we each have a role to play. On a personal level, I was especially encouraged that a number of Cru leaders participated in this event within the context of multi-ethnic community. We had a healthy discussion after the livestream concluded and I trust that those dialogues will continue and, ultimately, will result in positive action. The discussion was great but the its true effectiveness will be measured in changed hearts and increased friendships across ethnic lines. For me, I've already seen positive results. Just this morning at a men's small group Bible study through my church, we had a vigorous discussion about "A Time to Speak" and the current realities of race in America. As we shared our opinions, I realized that one of my friends in the group held a much different perspective than me. We had a tense, yet respectful, interaction where our perspectives were shared. After the group was over, this friend and I took the time to talk further. We listened to one another more fully and sought to understand where the other was coming from. We looked for common ground and challenged one another's assumptions. Our conversation ended with him asking for suggestions on practical ways that he can learn more about these issues with different perspectives than his own. It was a gracious dialogue between two Christian brothers with differing viewpoints yet both seeking to understand the other. Though we share the same ethnic background, we do not view these issues in the same manner. But we were able to talk about it and, hopefully, it will result in greater understanding on both our parts as we relate to those that live in different worlds than our own. And that is my hope for what happens after "A Time to Speak." That honest and vulnerable dialogue will translate into greater empathy for one another. And that, eventually, that empathy turns into concrete loving action where people of various ethnicities build real and lasting friendships with one another. As much as I support the fight against unjust systems and structures, we could end up on an equal playing field yet still hating one another. Yes, let's fight inequality and injustice, but let's do so spurred on by the gospel and in the context of friendship and Christian brotherhood. We'll be all the better for it. Something took place over 2,000 years ago in a tiny Middle Eastern town that changed the course of human history. The biblical text tells us that the soon-to-be mother of a little child was told that the boy she was carrying was special. His name would be Jesus and He would be the Savior of all mankind. There is a longing within the human heart for the Hebrew concept of Shalom, when peace reigns and all is right with the world. Our hearts ache for something better as we grapple with the heartbreak, pain and death that life often brings our way. We wonder if we are all alone is this world that we inhabit. We question if there is someone greater than us that sees and cares and will respond to our needs. The birth of the baby Jesus answers this query. The angel that foretold his birth said that He would be known as Immanuel, which means "God with us." 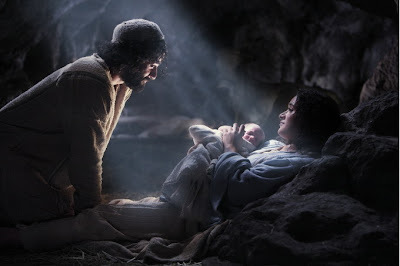 Previous to the birth of Christ, God's Spirit was present but in a much different way. With the coming of Christ (Advent), God took on human flesh -- the incarnation -- and came to live among us. He experienced what we experience and saw what we see. He experienced pain. He knew hunger and tiredness. He lived under an oppressive regime. He even went through a painful death. He endured the same kind of temptations and struggles that we do, but didn't sin. It's quite amazing once you stop and think about it. The fact that "God is with us" means that there is hope. We do not walk through life alone. Even with economic challenges, the unjust deaths of children, women and men and the threat of war ever before us, our God is among us. His Spirit is present and He lives within those that are His true followers. As I think about the uncertainty that tomorrow brings, I take comfort in the reality of Immanuel. One of my favorite modern Christmas songs is Our God is With Us from Steven Curtis Chapman's first Christmas album, The Music of Christmas. May the truths contained in this video bring peace to your heart. Protests have swept across the United States in response to the death of black men like Michael Brown and Eric Garner at the hands of law enforcement. 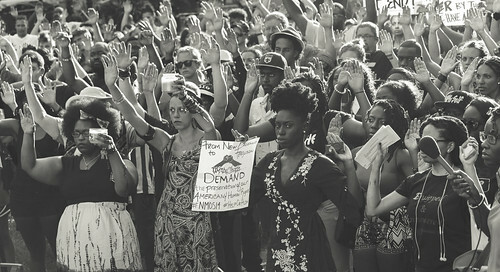 Thousands have proclaimed refrains of "Hands Up, Don't Shoot" and "I Can't Breathe" in order to emphatically state that Black Lives Matter. For those of us in the Christian community, calls have gone out from our African American brothers and sisters to join them in their fight for justice. Sadly, these calls have gone largely ignored. Although there are a number of non-black Christians that are seeking to bring attention to this important issue, many of us within the majority culture simply aren't paying all that much attention to what is going on. Why is that? I'm sure there a number of factors that contribute to this but one primary reason is that we're largely incapable of offering an empathetic response to those in the black community. Even though white and black Christians claim the same faith and read the same Bible, our worldview, which is shaped by our life experiences, cause us to interpret issues of race and culture quite differently -- see Divided by Faith: Evangelical Religion and the Problem of Race in America by Michael Emerson and Christian Smith for further insights into these realities. The dismissive response that too many of us as white Christians have offered in light of these protests indicates that we are not seeking to understand those in the black community. Instead of asking, "Why are so many people so upset about this?" we instead decide that the protesters, even the majority that are doing so peaceably, do not have a right to do so. Though we've never spent a single day as a black person in America, we assume we can speak to the experience of those that have. This is not empathy. In seeking to develop this kind of empathy, one of the best ways that we can do so is to develop friendships with those of different ethnic groups. While not able to fully understand what it is like to experience America as an ethnic minority, we can gain a greater appreciation for the realities of those from ethnic minority groups through honest and humble dialogue and spending time with them in "their world." This can aid us in seeing systemic injustices that ethnic minorities may experience -- helping us to see that racism is often experienced beyond individual events or people. Another great way to grow in our empathy is to expose ourselves to alternative news sources. We tend to spend the bulk of our time listening to those voices that we know we already agree with. This limits our growth and hinders our ability to be challenged. Our stereotypes and biases remain unchanged and we continue on with our lives not knowing where our perspectives may be misguided. By seeking out different voices to listen to, especially from those that have experienced the world differently than I have, I find that I grow in my ability to see the world through different eyes and to truly experience empathy with others. As mentioned previously, I don't think I can fully appreciate nor understand what it's like to live, for example, as a black man in America, but I can allow God to do a work in my heart so that in my listening and teachability, I might grow in my empathy for others. Though a lot of Christians have remained silent about racial injustices throughout the history of our country, there is a growing number that refuse to stand idly by while our brothers and sisters are mistreated and disregarded. We believe that how we treat one another is a reflection upon how we view God.